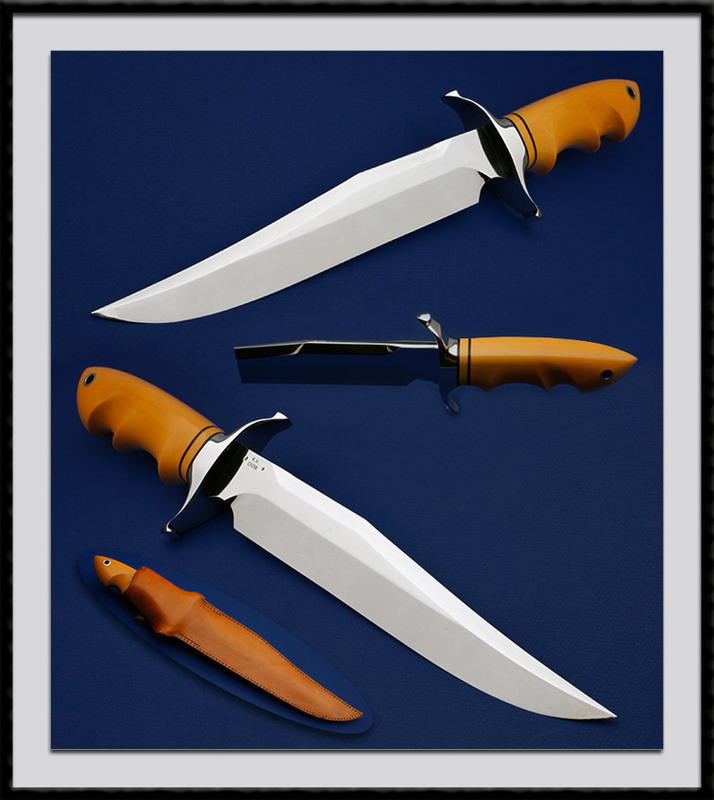 W. W. Cronk and namesake of the prestigious "Cronk Award" given by the American Knife makers Guild at their yearly show for the knife voted best of the "bunch", crafted this fighter with Mirror polished Blade steel of 440C from 5/16" + stock, BL = 10 5/8”, OAL is 16 1/2", Stainless Steel fittings and a Sculpted Ivory Micarta handle accented with 2x Black spacers and a SS lined Thong hole. Top shelf fit and finish from a deceased Icon of the knife making world. Condition is near Mint with some tarnishing points mostly on the "B" side that can be seen in the picture. Comes with the custom leather sheath pictured.